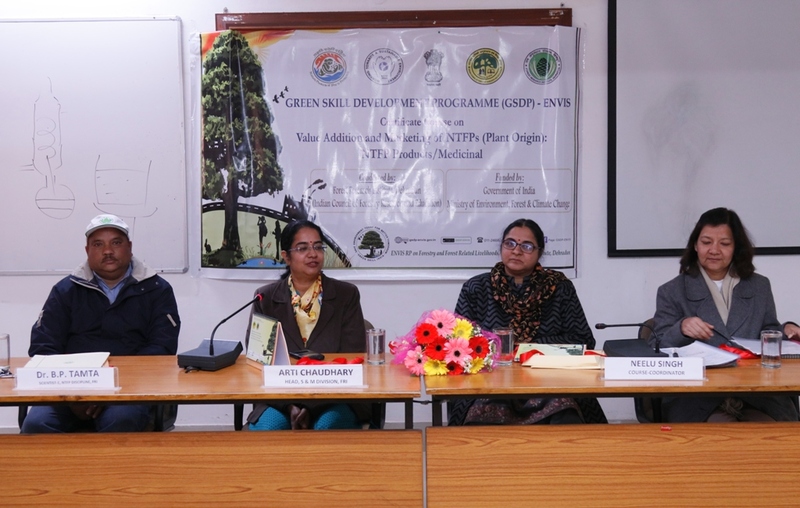 Forest Research Institute, Dehradun has organized 100 hrs certificate course on “Value Addition and Marketing of NTFPs/Medicinal Plants” from 4 th February to 19 th February, 2019 under Green Skill Development Programme (GSDP), sponsored by Ministry of Environment, Forest &amp; Climate Change, New Delhi. The training programmeis attended by participants from different states of India.During the course, participants underwent the training on different aspects of value addition techniques and marketing of different NTFPs viz., mushroom cultivation and their processing, non destructive harvesting of NTFPs,honey bee keeping, extraction, utilization and marketing of essential oils, aggarbatti making, non edible oil seeds and their utilization in soap, biopesticide and bio-fertilizer preparation and charcoal making using cellulosic NTFPs wastes. Field exposure visits to Patanjali Ayurved Ltd., Haridwar, Sushila Tiwari Herbal Garden, Rishikesh, Bagwan Gramodyog Samiti, D.Dun, Khadi Grammo-udyog ommission, Dehradun, Green Bio-Tech Pharmacy and Centre for Aromatic Plants,Dehradun were conducted during the training programme. Participants also elaborated that the topics covered under the training programme would be very beneficial to start entrepreneurship and further added that the major focus of the training was to impart the practical knowledge on NTFPs.This training will be immensely beneficial for future carrier development or employability for us.The chief guest of the ceremony,MrsArtiChaudhary , IFS, Head, Silviculture &amp; Forest Management Division ,FRI, Dehradun emphasized the need of judicious utilization of NTFPs for the development of various products. All the Officers, Scientists and Technical staffs of Silviculture and Forest Management Divisionwere present during the ceremony of the training.